MANSFIELD, Mass. 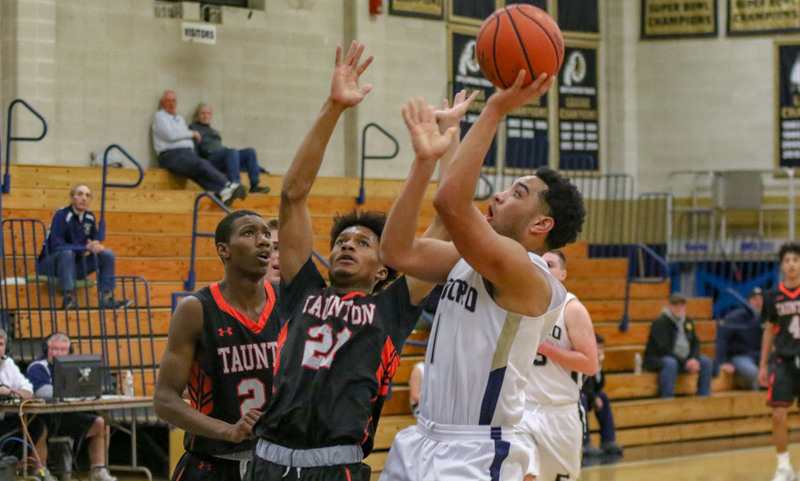 – Throughout the first half, the Mansfield boys basketball used a swarming defense and unselfish play on offense to build a double-digit advantage and looked poised to run away with a win. But Foxboro refused to go away, scoring more points in the third quarter than the entire first half while holding the Hornets to just seven points to get back into the game. And the Warriors used a 6-0 burst early in the fourth quarter to cut Mansfield’s 22-point lead down to just seven with the chance to make it a two-possession game, down 43-36. The Hornets were able to get a stop to keep the lead at seven and sophomore Matt Boen (seven points, 10 rebounds) converted a traditional three-point play on the other end of the court to extend the lead back to 10 and Mansfield closed out the final five minutes strong to earn a 57-42 win over the visiting Warriors. Mansfield forced a turnover on the defensive end, just one of three Foxboro turnovers in the second half compared to 17 in the opening 16 minutes. That resulted in a free throw from sophomore TJ Guy (10 points, five assists). The Hornets got yet another stop and senior Tommy Dooling (10 points, four assists) found junior Sam Stevens (10 points, six rebounds) for an open triple and a 50-36 advantage with 3:44 to play. Foxboro cut it back to 10 with just under three minutes to go but Boen drained a corner three with two minutes to go to end any comeback hopes. After being held to just 5/17 shooting from the field and forced into 17 turnovers in the first half, Foxboro looked like a new team in the second half. The Warriors were able to turn a 19-point deficit at halftime (33-14) into a 10-point game after the third quarter. Sophomore Kevin Gallagher scored six of his career-high 14 points in the third frame while juniors Ryan Hughes and Will Morrison (nine points) each chipped in with five points in the third to help Foxboro get back into the game. And defensively, the Warriors only allowed seven points on 3-for-11 shooting while forcing six Hornet turnovers. Gallagher and Morrison each hit a triple over the first four and a half minutes of the quarter, but Foxboro made its big run with a 10-4 burst over the final three minutes of the quarter. Hughes made a putback and converted a free throw for a three-point play, Gallagher hit another three, Hughes scored on a breakaway after a nice defensive play, and Morrison hit two free throws as the buzzer expired to make it 40-30. In the first half, it was almost all Mansfield. Each team had just one three-pointer after four minutes of play but Mansfield rattled off a 12-0 run in just 90 seconds to change the game early. Guy and Damani Scott (16 points, 11 rebounds) each had a pair of buckets and Dooling hit a triple in that stretch while Foxboro turned it over six times. Michael Devlin gave Foxboro a lift with a couple of nice defensive plays and had back-to-back baskets to make it 15-7 at the end of the first. In the second, it was more of the same for Mansfield. The Hornets forced six more turnovers in the second quarter and shot 5-for-11 from the field to create a double-digit lead by halftime. “Obviously it wasn’t a pretty first half for us offensively. I thought our half-court defense was solid, but unfortunately, they got a ton of points off of our turnovers. Offensively, we looked like an inexperienced team, guys were tentative and not trusting themselves, passing up wide open shots they make in practice, and obviously turning the ball over too much. Mansfield boys basketball (1-0 Hockomock, 1-0 overall) is back in action on Friday when it travels to Attleboro. Foxboro (0-1, 0-1) will try to bounce back on the road at Canton on Friday night. SHARON, Mass. – With 29 career starts already under his belt, it’s easy to forget that Foxboro’s Brandon Borde is just a sophomore. And you’d never know it based on his performance on Saturday night. Borde poured in a career-high 25 points in a dominant effort, helping Foxboro pick up a 73-46 win over the Eagles in the first Davenport division game of the season. After starting all but one game during his rookie year (senior night), Borde wasted little time getting going during his seventh start of this season. He scored 11 points in the first quarter, helping Foxboro build a double-digit lead it never surrendered. By halftime, Borde had already surpassed his career-high mark with 19 points and then added six points in the third quarter before resting for the majority of the final frame. 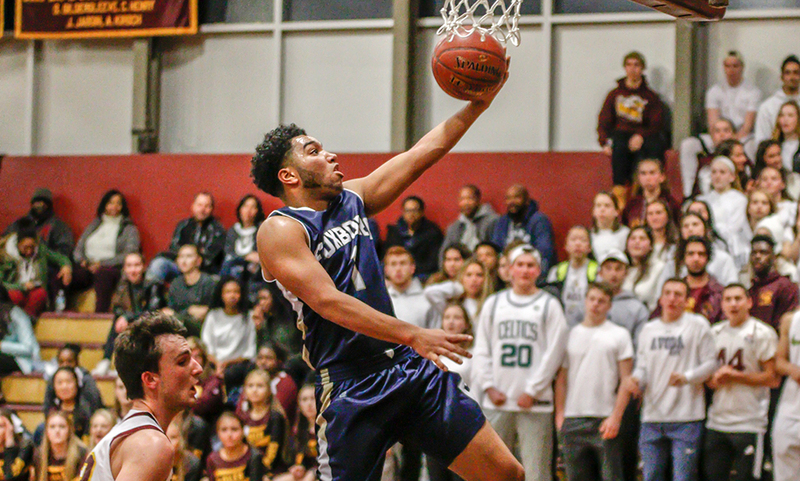 “We’ve been really begging him to be more aggressive in terms of looking for his own shot and attacking the basket,” said Foxboro head coach Jon Gibbs. “He’s such an unselfish kid and such a good passer that a lot of times he defers and he doesn’t realize how good he is. The Warriors and Eagles matched one another through the first five and a half minutes, but Foxboro seized control of the game by closing with an 11-0 run. A free throw from Bobby Harrison and three free throws from Joe Morrison after the buzzer sandwiched a 7-0 run from Borde himself. Up 10-8, Borde hauled in a defensive rebound before converting at the rim on the other end. After Sharon came up with a block, Borde drained a three on a feed from Anthony Mollica, Sharon missed a three and Borde pulled up in the lane for another two to make it 17-10 with under a minute to play in the first. The sophomore kept it going in the second quarter. 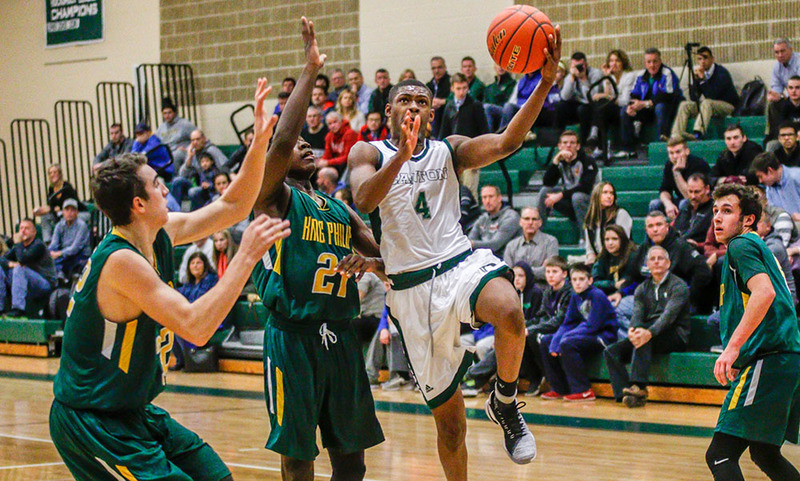 When Sharon’s Malik Lorquet opened the frame with a traditional three-point play to give the home side some momentum, Borde answered with a strong take to the rim himself, converting while being fouled; he also converted the free throw. After sophomore Will Morrison hit a pair of free throws, Borde read a cross-court pass, picking it off and laying it in for an easy two. Sharon’s Jayvon Monteiro responded with a layup of his own but Borde drained his second triple of the half on a pass from Joe Morrison, giving Foxboro a commanding 30-13 lead. Foxboro took a 39-18 lead into halftime. Foxboro put to bed any hopes of a comeback with its best offensive quarter of the game, pouring in 21 points in the frame on 53% shooting. Both Joe Morrison (two three’s) and Borde scored six points in the quarter while Teddy Maher and Ryan Hughes each contributed. Mollica capped the quarter with his first field goal fo the game, a three-pointer after Joe Morrison forced a turnover on the defensive end. With both teams playing their starters, Foxboro held the Eagles to 38 points on 35% shooting from the field while forcing 17 turnovers. It marked the sixth time in eight games an opponent has scored fewer than 5 points with Mansfield (50 points) and Franklin (52 points) the lone teams to reach the half-century mark. Lorquet led Sharon with 11 points and six rebounds while Lester High and Jimmy Fitzhenry each scored 10 points for the Eagles. 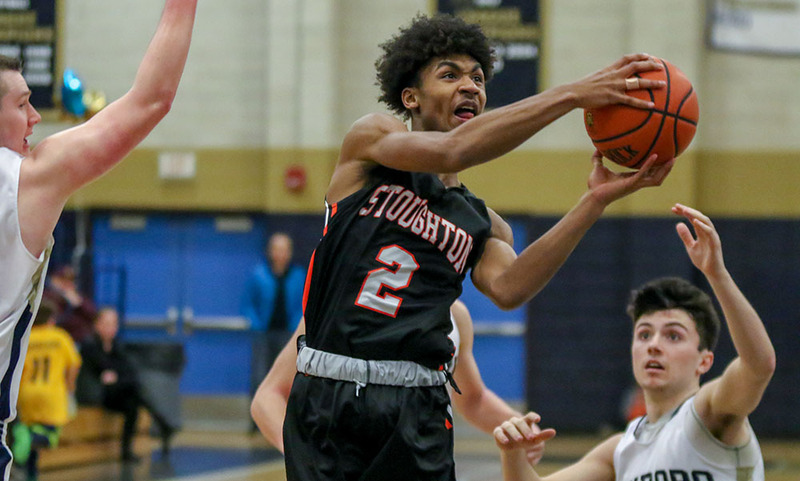 Foxboro boys basketball (3-1 Hockomock, 7-1 overall) is back in action on Tuesday when it hosts Stoughton. Sharon (0-4, 1-6) will try to get back on track on Tuesday when it hosts North Attleboro at 6:30. FOXBORO, Mass. 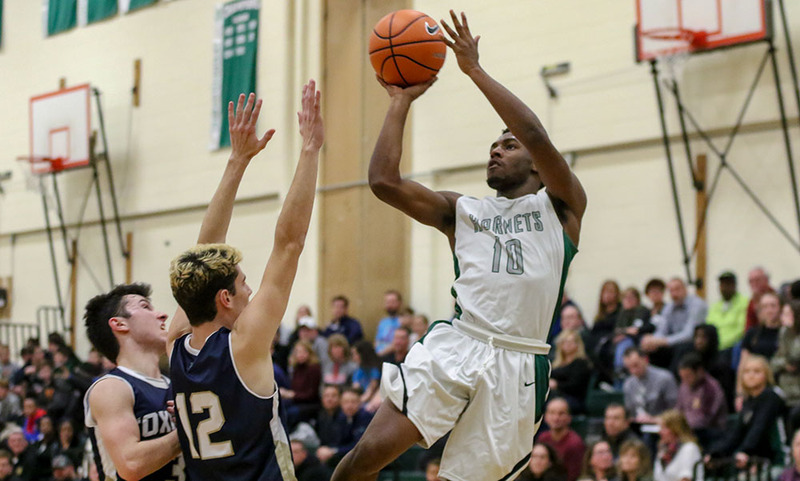 – Mansfield saw its 13-point fourth quarter shrink to just three inside the final minute, but senior Ryan Otto made a huge bucket to help the Hornets hold on for a 50-43 win over Foxboro. Mansfield senior John McCoy drained a contested three with 6:39 to play to put the Hornets comfortably ahead 44-31, but then Foxboro orchestrated an impressive comeback. 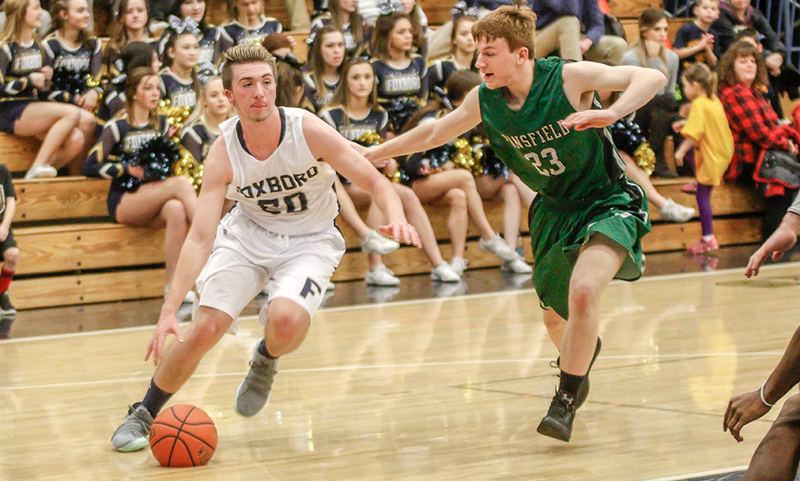 Foxboro sophomore Brandon Borde played a vital role in the run, scoring six of his career-high 14 points and assisting on a bucket to Matt Rongione as Foxboro rattled off eight straight points. Mansfield junior Damani Scott ended the Hornets’ drought with 1:53 to play, driving to the basket for two and a 46-39 lead. But a bucket from Teddy Maher, and then a steal and two free throws from Joe Morrison (14 points, nine rebounds, five assists, three steals) suddenly made it a one-possession game with 55 seconds to play. But on the ensuing possession, Mansfield had its biggest answer of the game. With the shot clock about to tick into single digits, Otto dished the ball to junior Tommy Dooling in the corner, but he quickly returned the ball to Otto who drained the three — his first made field goal of the game — to make it 49-43 with 35 seconds to play. The Hornets came up with a defensive stop, Scott hit a free throw to extend the lead to seven and Mansfield picked up its first win of the season. “I think we’re trying to find our identity,” said Mansfield head coach Mike Vaughan. “I don’t think its a lack of ability as much as its a lack of identity. We had a lot of empty possessions because of not doing things the way we do it. To Foxboro’s credit, they did a tremendous job defensively at taking away some things, and they got some opportunities they capitalized on. Obviously, Morrison and Borde offensively kept them relatively close. I thought Foxboro did a nice job. It was the second big lead that Foxboro erased. Mansfield got off to a strong start, racing out to a 10-2 lead over the first four minutes of play. But over the final four minutes of the opening stanza, Foxboro rallied with an 11-3 run to tie the game. “I thought our guys showed a lot of fight and a lot of heart, in both halves,” said Foxboro head coach Jon Gibbs. “We got down 13-4 and we could have gone into a shell and we didn’t. We stayed together and got back into and the same thing in the fourth quarter. We could have quit both times and both times we stayed together and got back into it, so that was encouraging. Foxboro took its first lead of the game on a three-pointer from Devin Hassett, up 18-15, with 5:05 to play in the first half, but Mansfield close the half with a 13-5 run. John McCoy sandwiched a bucket and a three-point play around a bucket down low from Sam Hyland. Dooling hit his third three of the game and Hyland completed a traditional three-point play in the final seconds to take a 28-23 lead into halftime. McCoy tied a career-high with 17 points to lead the way for the Hornets, also pulling down six boards. Mansfield’s first double-digit lead came midway through the third quarter when McCoy got to the rim for two and a 35-25 lead. Foxboro quickly cut it back to single digits on a bucket from Borde on an assist from Morrison down low but Khristian Conner drove hard to the basket to restore the 10-point lead on Mansfield’s ensuing possession. The Hornets kept that lead until the final seconds of the quarter when Foxboro sophomore Ryan Hughes converted a traditional three-point play off an offensive rebound to make it 39-31. Scott (five rebounds, two assists) and Dooling each finished with nine points for the Hornets while Hyland added six points and seven boards. Foxboro hits the road for the first time, traveling to take on King Philip (1-0, 1-0) at the same time.